Kanye West's Saint Pablo tour stopped in Seattle Washington Wednesday night, and, to probably no one's surprise, Yeezus ended up delivering the kind of diatribe we've come to expect from the outspoken artist. During the set, the rapper decided to drop some truth bombs about his his recent (lack of) collaboration with Drake and Jay-Z. Apparently, it all has to do with Apple and Tidal, the latter of which is owned by Jay-Z and partly owned by Kanye. According to Kanye, the two music streaming services are responsible for "some bullsh*t" and are the reason that reason Kanye and Jay Z weren't featured on "Pop Style" when it appeared on Drake's Views. 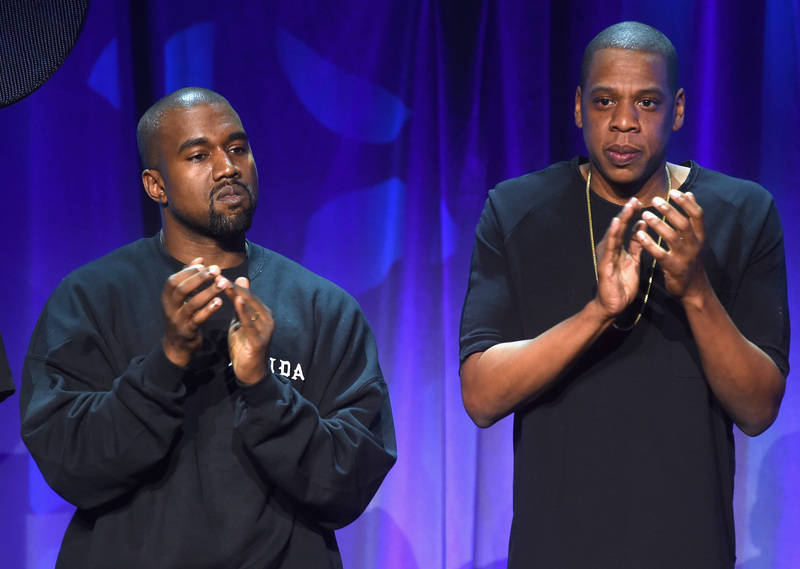 Bustle has reached out to Tidal, Jay Z, and Kanye for comment, but has not heard back at this time. Apple had no comment on the story. “And we sent it back to him and he’s like ‘Oh sh*t The Throne is on this sh*t,’” Kanye said on stage, regarding his — and Jay—Z's — verse for "Pop Style." He continued, “Then Jay thought about it and out of respect for Meek Mill he didn’t want to be on the track. Then I said, ‘Look, I’ll call Drake, I’ll call Meek, I’ll call y’all, we gotta squash this sh*t, we gotta let people have this song.’ But then it went out of that territory and it went into some Tidal sh*t, some political sh*t, some sh*t about percentages on songs. I can't take this sh*t, bro." He added “There will never be a Watch the Throne 2. You know why? Because that's the reason why I wasn't on the song. I wasn't on the song because of HOV. Because this is Tidal/Apple bullsh*t."
Business differences are one thing, but it sounds like 'Ye's pissed about some personal stuff too. He started to get into his friendship with Jay, knocking him for not visiting the rapper following his wife Kim Kardashian's traumatic robbery. He told the crowd, “Don’t call me, after the robbery, and say ‘How you feelin’?’ You wanna know how I’m feeling? Come by the house. Bring the kids by the house, like we’re brothers." A concert goer tweeted that Kanye said his own children “have never even played together with Blue Ivy" (Jay-Z and Beyonce's daughter).